Lori Lynn Ellis - Edmonton's Burial & Cremation Professionals | Trinity Funeral Home Ltd.
On Friday September 19, 2014 Lori Lynn Ellis returned home to her Father in Heaven. 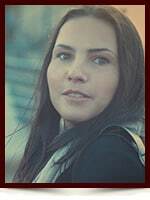 Born February 9, 1978 in Edmonton, AB Lori was just 36 years old at the time of her passing. Lori was a light in this world with her witty sense of humour and fun-loving personality. She made friends everywhere she went. People were drawn to her positive energy and radiant smile. She was a loving mother to her 16-month-old son, Rudy. To her nieces and nephews, she was the fun, crazy aunt. Loved ones will miss Lori’s sense of adventure. Whether she was traveling the world or dressing up for a night out, Lori was always up for a good time. Lori loved the outdoors, so it was fitting that she lived in the Banff area for more than a decade. She was athletic, completing several triathlons. She also enjoyed paddle boarding, snowboarding, and running daily with Rudy. From the time she was young, Lori loved to read. She was an exceptional student, graduating from Paul Kane High School in St. Albert and completing nursing school at Mount Royal University. She enjoyed her work as a nurse at Foothills Medical Centre in Calgary and Sturgeon Community Hospital in St. Albert. She always wanted to become a doctor – a desire she said she got from her grandfather the late Dr. Burns Larson. Lori was a true friend – a good listener with a caring heart. Loved ones will remember long talks and many laughs with Lori. She always had a story to tell. Life was never dull with her around. She had nicknames for everyone in her family and she and her two brothers could keep the whole house laughing for hours with their jokes and hilarious storytelling. Lori loved her little boy dearly and her light lives on in him. Family members will treasure the sweet memories of Lori and share them with Rudy through the years – until the day when we are all reunited as an eternal family forever. Lori is survived by her son, Rudy (16 months) and his father Paul Comaniuk, her parents Randy and Joanne Ellis, and her siblings Tyler Ellis, Adam (Laura) Ellis, Karli (Brad) Prince, and Jordan (Greg) Turgeon. An education fund has been set up for Rudy. If you would like to donate to support Lori’s son, you can do so by clicking here. Although it has been some time since I last saw her radiant smile I was quite saddened by the hearing of Lori’s passing. She could light up a room with that smile and was a good friend to many. I was one of the fortunate ones to have met Lori in Banff all those years ago. With all my heart I send my condolences and hope that you can take away the love and kindness she always had and gave too others. My thoughts are with you. We are so saddened to hear of your daughter’s passing, Randy and Joanne. It was such a sweet moment when Jim and I saw Randy last Friday. Our hearts are broken for you. We miss seeing and serving with you. Our prayers for the Lord’s promised comfort are with you and your loved ones today. I was very saddened to hear of Lori’s passing. She was so smart and such a beautiful person both inside and out. When we would talk, I found her to be so engaging, lively, witty, insightful and compassionate. She was my favourite massage therapist. My condolences to all her family members. Please know that you are not alone in your grief. May God bring you comfort you as you navigate through the coming months. May life be kind to you as you accept this new normal in your lives. A beautiful Ray of sunshine now an Angels Light. You will be Greatly missed and always in our hearts. My heart and prayers reach out to everyone who knew you and loved you! Your beautiful soul touched every you passed by!